When spring arrives, I want to throw open the windows and let the fresh air in. But sometimes letting the fresh air in also let’s all the dirt and grime that’s been building up over the winter months right into the house. Prevent this from happening by using our 8 steps cleaning windows. 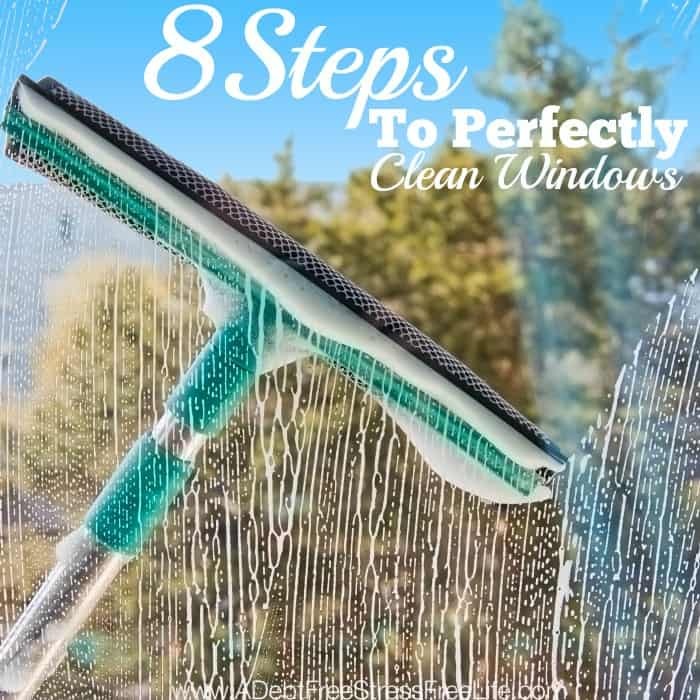 These steps you’ll turn your dingy windows into perfectly clean windows that are ready for spring. Oh, and if you’re looking for the window washing checklist, you’ll find it in the Free Resource Library. Don’t have access? Scroll down and sign up to get instant access to the Resource Library and come back often because I love adding new freebies for you! The first step to perfectly clean windows is to establish your window washing kit. Having your kit assembled with the proper products will ensure you get your windows as clean as the professionals. If you have windows that tilt in you won’t need a ladder unless of course, you have windows that can’t be reached without one. Because I’m afraid of heights, I always hire out the cleaning of my windows and very high light fixtures. If you have someone in your home who’s willing to get on a ladder, then have them help you. If not, don’t risk a fall because you’re too anxious completing the task. You’re going to be using very specific products, just like the professionals. Professional window washers use squeegees to get windows sparkling and streak-free. The squeegee you’ll use for a standard window is usually longer than most buckets are wide. In my opinion, it’s worth investing in a window washing bucket to hold all your supplies. These buckets can be found at most home improvement stores or on Amazon.com. Your Bucket: Instead of being round these buckets are rectangular and accommodate the squeegee easily. The one pictured here easily fits a 14-inch squeegee. Rubber Gloves – Protect your hands from the dirt and detergent you’ll be using. Sometimes older windows have sharp edges or splints of wood that can cause damage to your skin. A good pair of heavy-duty rubber gloves will prevent injury and keep your hands soft and smooth. The Squeegee – The squeegee is the most important tool in the window cleaning process. If you’re serious about getting your windows cleaned like a pro, buy a good quality squeegee. A quality squeegee will come assembled in three pieces. The handle, the channel and the piece of rubber supported by the channel. The rubber can be turned over when it gets old, and then replaced when both sides have worn out. There are various sizes to choose from depending on the size of the windows you’ll be cleaning. I own several and use them according to the window I’m cleaning. You’ll also need a wet cover for your squeegee. Again get the proper size to fit your squeegee. Some covers come in different textures to help with scrubbing off debris that’s stuck to the window. Wet covers are machine washable and can be used over and over again before needing to be replaced. Scraper – A scraper usually comes with replaceable metal blades and is useful to get tough marks off, such as paint, varnish or stubborn insect marks. A little one inch, pocket scraper is usually enough for most maintenance jobs. A word of caution: don’t attempt to use a scraper if you don’t know how to use it correctly. You could do permanent damage to your glass. Dry Cloths – You’ll need a good supply of dry, lint-free or microfiber cloths to complete the cleaning process. Make sure you don’t wash any of your dry cloths with fabric softener. They will leave streaks. If you make the mistake, just rewash and dry them. I’m going to give you my top-secret cleaning solution recipe…ready…here goes…. Palmolive or Dawn Dish Detergent and water. That’s it! You can save yourself a ton of money by using either brand of dish soap to get your windows sparkling clean. I’ve tried a lot of them, and I always come back to Palmolive or Dawn. Some people recommend vinegar and water. Here’s why I don’t: it doesn’t suds up. The suds are important to lubricate the rubber as it passes over the glass, making it a lot easier to turn the squeegee. They also make it easier to see any watermarks that need wiping off. The suds also help to show up areas that need more scrubbing because the pattern of the bubbles separate more where there is a finger mark or some other dirt. 1. Pick the right day to wash your windows – cloudy days or shadow facing windows are the best to clean. The sun will only cause streaking despite your best efforts. 2. Put on your rubber gloves to protect your hands from damage. Then clean the surface with a soft-bristle brush, dust away cobwebs and loose dirt from windows, frames, hinges, sills, and tracks. 3. To prevent messes from drips and dirt, place a towel on the windowsill. 4. Fill a bucket with dish detergent and cold water. Don’t make the water too hot or it will evaporate from the window before you get a chance to clean it. 5. Dunk your squeegee which has the wet cover or washing cloth attached, into the bucket of warm, soapy water. Smear the solution over the entire window. Scrub the window of debris and dirt. This is the time to use the scraper if warranted. If you need to use the scraper, make sure only to pass the blade in the forward direction, i.e. don’t scrape backward – this could drag the dirt, cement, etc. across the glass causing scratches. 6. Remove the wet cover or washing cloth from the squeegee. Working from top to bottom, draw the squeegee across the window, removing the cleaning solution and dirt from the glass. Curve the squeegee downward at the end of each stroke. 7. Use a fresh, clean cloth to wipe the squeegee dry after each pass across the window. Work from the top of the squeegee moving down to the bottom. A dry squeegee avoids drips and keeps streaks from forming. 8. When you’re done with the squeegee, run the cleaning cloth along the “wet” side of the window to dry the drips left behind. Move to the window sill and soak up any cleaning solution. Polish the sill dry with a fresh cleaning cloth. In just eight easy steps you’ll have your windows looking like a professional cleaned them. They’ll be sparkling, streak-free and ready for you to throw them open and let the warmth of spring into your home. Did you enjoy this post? Looking for more spring cleaning articles?